Traditional agricultural systems, sometimes termed subsistence agriculture, which feed most of the poorest people in the world. These systems are of interest as they sometimes retain a level of integration with natural ecological systems greater than that of industrial agriculture, which may be more sustainable than some modern agricultural systems. Food production and demand on a global basis, with special attention paid to the major producers, such as China, India, Brazil, the US and the EU. Various sciences relating to agricultural resources and the environment (e.g. soil science, agroclimatology); biology of agricultural crops and animals (e.g. crop science, animal science and their included sciences, e.g. ruminant nutrition, farm animal welfare); such fields as agricultural economics and rural sociology; various disciplines encompassed in agricultural engineering. 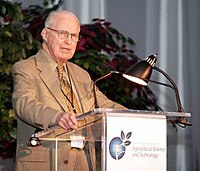 Agricultural biotechnology is a specific area of agricultural science involving the use of scientific tools and techniques, including genetic engineering, molecular markers, molecular diagnostics, vaccines, and tissue culture, to modify living organisms: plants, animals, and microorganisms. One of the most common yield reducers is because of fertilizer not being applied in slightly higher quantities during transition period, the time it takes the soil to rebuild its aggregates and organic matter. Yields will decrease temporarily because of nitrogen being immobilized in the crop residue, which can take a few months to several years to decompose, depending on the crop's C to N ratio and the local environment. In the 18th century, Johann Friedrich Mayer conducted experiments on the use of gypsum (hydrated calcium sulphate) as a fertilizer. In 1843, John Lawes and Henry Gilbert began a set of long-term field experiments at Rothamsted Research Station in England; some of them are still running. ^ "What is Agricultural Biotechnology?" (PDF). Cornell University. Archived (PDF) from the original on 26 February 2015. Retrieved 3 February 2015. ^ "The Long Term Experiments". Rothamsted Research. Archived from the original on 27 March 2018. Retrieved 26 March 2018. ^ Hillison J. (1996). The Origins of Agriscience: Or Where Did All That Scientific Agriculture Come From? Archived 2 October 2008 at the Wayback Machine. Journal of Agricultural Education. ^ Huffman WE, Evenson RE. (2006). Science for Agriculture. Blackwell Publishing.